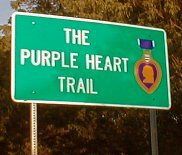 Interstate 64 in Kentucky is designated the Purple Heart Trail. The transportation cabinet has erected signs noting this designation at the Indiana and West Virginia state lines as well as each county line crossing along I-64 in Kentucky. I-64 is Kentucky�s major east-west highway; it connects Louisville, Frankfort, and Lexington to Ashland in the far eastern part of the state. Construction started on parts of I-64 in 1958 and the entire route in Kentucky was completed by December of 1976. The length of I-64 in Kentucky is 191.507 miles. This includes 6.308 miles that I-64 shares with I-75 in Fayette County. H.B. Elkins: Interstate 64 - A guide to I-64's exits in Kentucky. Indiana Highway Ends: I-64 - Information about I-64 in Indiana. Kentucky Transportation Cabinet Divison of Planning: I-64 Strategic Improvement Plan: Final Report - Materials from the final report concerning improvements to I-64 over its entire length in Kentucky. Ohio Valley Transit: I-64 Kentucky - A history of I-64 in Kentucky. LOUISVILLE, Ky. (September 10, 2011) � The public should expect long traffic delays, especially during peak rush hours, with the indefinite closing of the Sherman Minton Bridge between Louisville and New Albany, transportation leaders on both sides of the Ohio River announced today. Mayor Greg Fischer, joined by officials from the Indiana Department of Transportation and the Kentucky Transportation Cabinet, announced the following items to help alleviate some of the congestion. When possible, it�s important for people to avoid peak travel times in the morning and evening. People should carpool � three or four to a vehicle � to help reduce the number of automobiles on the interstates. People should stagger their commute times � going to work early and leaving early or going to work late and leaving late. Companies should be as flexible as possible and allow employees to work from home�to telecommute�and to have staggered arrival and departure times. If possible, when traveling within Louisville, drivers should use surface streets and stay off the interstate. This will cause more congestion on side streets, however it will help alleviate cars on the interstates. A detailed traffic management plan is being developed to ensure that congestion is alleviated as much as possible for as long as the bridge is closed. As soon as feasible, lanes of the Second Street Bridge will be converted to reverse lanes, though that is unlikely to occur before Monday. When the reverse lanes are in place, there will be three southbound lanes and one northbound lane during the morning commute. For the evening commute, that will reverse, with three northbound lanes and one southbound lane. Traffic flow on the Kennedy Bridge (I-65) will remain normal. Where possible, exit ramps along I-65 in Southern Indiana will be widened from one to two lanes to help traffic flow. In addition, officials from the Transit Authority of River City are working with the two states to develop plans to use public transit to move people by buses across the river. FRANKFORT, Ky. (July 31, 2009) The Interstate 64 twin bridges crossing KY 420 (Old Lawrenceburg Road) in Franklin County will undergo repairs beginning August 3rd. The project will involve maintenance repairs to the structural steel, expansion joints and bridge deck. Motorists may want to find alternate routes or adjust their plans during peak travel times. As part of the project, one lane of traffic will be closed continuously during the bridge deck work. Other phases of work will be performed underneath the bridge with minimal disruption to motorists. The speed limit will be reduced to 55 MPH in the vicinity of the work zone. The Sherman Minton Bridge which carries I-64 over the Ohio River west of downtown Louisville was closed for about three hours this morning after being struck by a barge. An inspection found that the bridge had only suffered superficial damage. At a recent citizens advisory board meeting, a route that would widen KY 32 between Sandy Hook and Morehead was chosen as the preferred alternative for a proposed extension of KY 645 from US 23 to I-64. This week, Shelby County officials got their first look at plans to widen I-64 to six lanes through the county. Work is expected to start in 2007 to widen I-64 from the Gene Snyder Freeway (Interstate 265/KY 841) in Jefferson County to mile marker 35 in Shelby County. The work will begin at the Gene Snyder Freeway and progress eastwards in four mile sections. The project should be completed by 2011. Plans for a rail trail linking Indiana and Illinois hit a snag when a segment of the abandoned Indiana Hi-Rail railroad bridge collapsed into the Wabash River in January. A group of civil engineering students at the University of Evansville were studying how to best rehabilitate the bridge which is located just upstream from the I-64 bridge. For about 18 hours motorists on I-64 could see that Shelby County claims to be the �American Saddlebred Capital of the World;� however, just 18 hours after the county road department installed the sign the state department of highways ordered the signs removed. Federal officials have established stringent rules governing the types of signs that can be installed along interstates, and the Saddlebred Capital signs ran afoul of those rules. The signs will remain along other highways, including US 60. The Ashland Daily Independent reports that Carter County officials have high hopes for the proposed KY 645 extension following recent public meetings. The Kentucky Transportation Cabinet is working to complete a feasibility study to determine if KY 645 should be extended from its current terminus at US 23 to I-64 near Morehead. A new connector route in Indiana provides a new route from Hawesville to I-64 in southern Indiana. The new Indiana 237 connects the Bob Cummings Bridge over the Ohio River at Hawesville to Indiana 37 and I-64. Planning continues for a proposed project to extend KY 645 from its current terminus at US 23 to I-64 near Morehead. No money has been allocated for construction of the project; however, a $500,000 feasibility study has been ongoing since 2002. The study will help determine whether such a route is needed and present preliminary alternatives for the route. A repaving and bridge rehabilitation project on I-64 near the Rowan/Bath County line is expected to complete in December. Three miles of the road are being repaved, and the deck of the Licking River bridge is being overlaid with a latex concrete. The latex concrete will serve to waterproof the bridge and extend its lifetime. Shelbyville, Shelby County, and state officials are preparing plans for dealing with alternate routes during emergency closures along I-64. In the past, such closures have resulted in clogged traffic along US 60. Plans for a new downtown bridge over the Ohio River at Louisville could disrupt the Waterfront Park. The section of the Northeastern Kentucky Industrial Parkway between KY 207 and US 23 at Wurtland opened on Thursday, Sept. 25. The two lane highway connecting I-64 to US 23 is intended to provide improved access to industrial development in Greenup County. The Kentucky Transportation Cabinet will hold an open house meeting to discuss changes to the KY 180/I-64 interchange from 5p.m. to 7 p.m. next Thursday, Sept. 11, at Boyd County High School. Diamond-grinding and concrete patching work on I-64 between Midway and the Franklin-Woodford County Line will begin Aug. 10 and will result in lane closures. The work is expected to last until mid-October. Public reaction to extending KY 645 from US 23 near Ulysses west to I-64 is mixed. Some claim it will cause environment havoc; others say it will improve the local economy. The employees of the eastbound I-64 rest area near Grayson in Carter County received 2002 Best Maintained Rest Area Award from the Kentucky Transportation Cabinet. The Kentucky Transportation Cabinet will be repairng a collapsing embankment on I-64 near the Carter and Rowan County line. The project is expected to take 6 weeks to complete, and traffic will be down to one lane in each direction. The Kentucky Transportation Cabinet has posted the final report concerning the construction of a new connector route northeast of Grayson in Carter County. There are a couple of more interesting presentations about road projects on the Kentucky Transportation Cabinet web site. They can be found here . One presentation is of the I-64 Weekend Project that was undertaken in Jefferson County late last summer. Another presentation covers the reconstruction of I-65 in Warren County . It includes this picture of a vehicle used to create the rumble strips along the shoulder. According to this article from the Ashland Daily Independent the third and final phase of the Northeastern Kentucky Industrial Parkway is expected to open by August. The 14 mile two-lane road known as KY 67 will connect I-64 to the EastPark industrial site. According to this article from the Ashland Daily Independent a redesign of the exit 185 on I-64 at KY 180 is being considered. The interchange has been the site of numerous fatalities. If approved by the state legislature, construction could start in 12 to 18 months. After receiving mixed feedback on a proposed connector between Grayson and I-64, the Transportation Cabinet may consider multiple options to relieve congestion in Grayson. See this article for more information. The KYTC will be holding a public meeting on February 25, 2002 to discuss a possible new connector to I-64 northeast of Grayson. For more information, see here . According to this Courier-Journal article , a $5.3 million bonus awarded to Gohmann Asphalt and Construction for finishing work in I-64 in Jefferson County has drawn criticism for being so large. It is the largest bonus that the KYTC can remember being awarded, and it appears that bonuses for early completion will be smaller in the future. The Lexington Herald-Leader reports in this Oct. 29, 2001 article (no longer online) that a group calling themselves Smart Progress is attempting to block the construction of a four lane connector between I-64 and US 60 near Morehead. The group is concerned that the road is not needed and will damage a recreation area in the Daniel Boone National Forest. The Courier-Journal reports in this Oct. 17, 2001 article that the KYTC is going to study traffic problems on the Snyder Freeway (I-265), I-64, and Shelbyville Road (US 60) in eastern Jefferson County. The Courier-Journal reports in this Oct. 1, 2001 article that the I-64 rehabilitation project in Louisville is finished. The project was completed several weeks earlier than projected, and the general contractor earned a $5 million bonus for the early finish. According to this Courier-Journal article , the weekend closings of I-64 will likely end this weekend. If so this rehabilitation project will end seven weeks ahead of schedule. The Ashland Daily-Independent reports in this Sept. 5, 2001 article that a new Flying J has opened off of I-64 in Cannonsburg. Roadgeeks seem to like Flying J's for some reason. The Courier-Journal reports in this August 30, 2001 article that I-64 in east Louisville will remain closed on Labor Day. This is part of the weekend closings to repave and refurbish the Cochran Hill Tunnels. The Courier-Journal reports in this August 25, 2001 article that due to good weather work on I-64 in Louisville may finish weeks early. The Ashland Daily Independent reports in this August 14, 2001 article that changes will be made at the US 23 and I-64 interchange to alleviate congestion caused by coal trucks. The lights in the Cochran Hill Tunnels on I-64 in Louisville will be off for the next few weeks. The Courier-Journal reports in this August 13, 2001 article that they are being replaced as part of the repaving work on I-64. The Courier-Journal reports in this August 12, 2001 article about the first weekend closing of I-64 for repaving work. They report that there were no delays along the detour routes and describe how the new pavement is designed to reduce traffic noise. The Ashland Daily Independent reported in this August 9, 2001 article that a group in Morehead plans to fight a proposed I-64 connector there. The connector would help to alleviate traffic in Morehead; however, the citizens are considered that it would adversely affect the environment. Thanks to Sherman Cahal for pointing out this article.